Now that a feasibility study is complete, Tom Cardamone, executive director of the Snowmass Discovery project, envisions a visitor center in Base Village, three on-mountain viewing sites and the reopening of Ziegler Reservoir for future exploration. When bulldozer operator Jesse Steele unearthed the remains of a Columbian mammoth while excavating a reservoir for snowmaking, it soon became apparent he had made one of the most significant archeological finds in Colorado history. 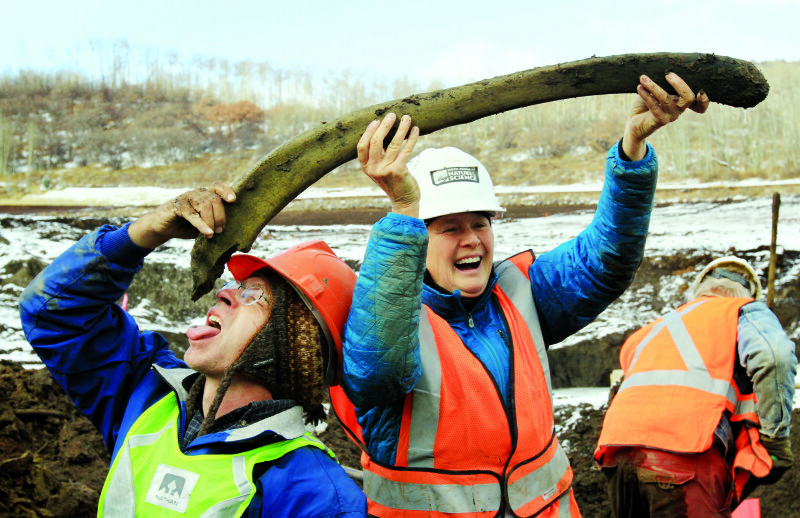 The discovery of a giant femur and tusk by the Gould Construction employee near Snowmass Village in October 2010 was just the tip of an Ice Age iceberg. By the time the crew buttoned up the site the following July, more than 5,000 bones from 40 different animal species, including what is believed to be the largest American mastodon, were pulled from their entombment in this high-altitude lake bed. As the fourth anniversary of the landmark discovery approaches, local consensus and momentum have finally aligned to showcase the stunning find as both a marketing and educational tool. Between the town’s general fund and the Snowmass Tourism marketing budget, more than $279,000 has been spent to date on studies and the operation of a small museum. “There has been a great deal of volunteer time and energy invested, and now we have a road map with which to move forward and engage the community significantly more than we already have,” said Tom Cardamone, executive director of the Snowmass Discovery project. While his work was very limited until the start of 2014, Cardamone has been working half-time on the project since the beginning of this year. Cardamone, well-known to locals as the longtime director of the Aspen Center for Environmental Studies, recently shared the results of a feasibility study with the Snowmass Village Town Council. Recommendations include an enhanced visitor center in Base Village, three observation areas overlooking Ziegler Reservoir on the Snowmass Ski Area and the development of a fundraising strategy to raise upwards of $10 million for the project. More than 5,000 bones were pulled from Ziegler Reservoir in 2011, including parts of what is believed to be the largest mastodon in the U.S.
A common element found in studies completed by former Field Museum director John McCarter in 2013, and the recently released Amaze Design feasibility report, is the scientific significance of the Ziegler Reservoir find. It’s well beyond the unearthing of a 16-foot-tall mastodon, many mammoths and the relatively rare ground sloth. Research gleaned from the project already has upended some previous theories on climate and species that roamed this area between 40,000 and 135,000 years ago. “The discovery is bigger than Snowmass, by far,” said Bob Purvis, who has been a member of the Snowmass Discovery Board since late 2013. Funding needs for the recommended next steps also may prove to be larger than what the local community can bear. “While significant philanthropical capacity exists in Snowmass, other friends and partners, such as the Denver Museum of Nature and Science, SkiCo, Related, CMC, ACES and various grants and the town, are also potential sources of support,” said Purvis. “Is $10 million a reasonable aspiration? Yes, but it’s yet to be fully tested,” he added. “Whether you’re a ski pro, a scientist or live here and are engaged in the community” it’s incumbent upon us as keepers of the story to trumpet details of the story, Cardamone said. Three dozen mastodons, 18 tusks, ancient horses, ground sloth, salamanders, deer and tree pollen are some of the remnants that were preserved within the peat and clay layers of the moraine lake. Dr. Kirk Johnson, then vice president and chief curator with the Denver Museum of Nature and Science, inspects the claw of an ice age ground sloth at Ziegler Reservoir during the big dig. Johnson is now the director of the National Museum of Natural History at Smithsonian Institute. 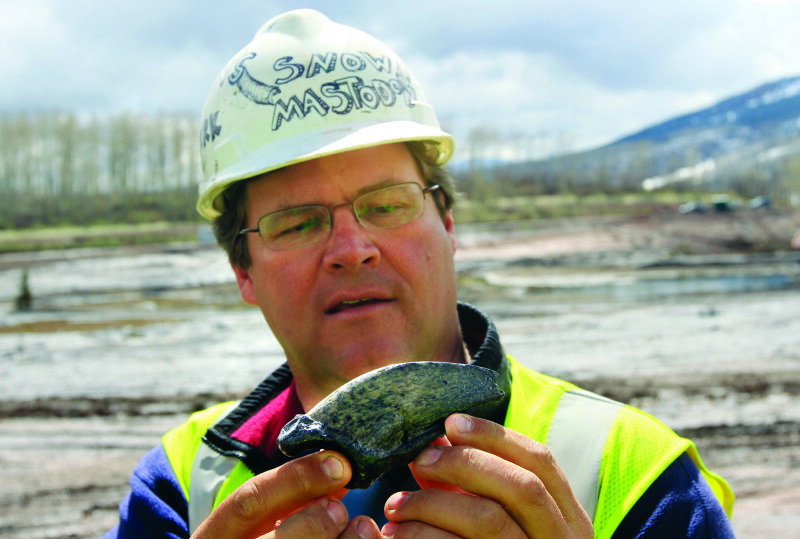 A project update is expected Sept. 30, when Dr. Kirk Johnson, former chief curator at the Denver Museum of Nature and Science who is now director of the National Museum of Natural History at the Smithsonian Institute, gives the keynote address at the Mountain-Plains Museum’s conference. The public is invited to the free discussion, which begins at 10:15 a.m. at the Wheeler Opera House. A group of potential donors also met last week at the Snowmass Village home of Tag and Francine Liebel to “generate community engagement,” and gauge the fundraising potential, Cardamone said. Part-time resident and Snowmass Sun columnist Mel Blumenthal donated $12,500 for a matching grant that has been augmented by contributions from other full- and part-time residents. “This was moving at a glacially slow speed until Tom Cardamone got involved,” Blumenthal said last week, in discussing his grant designed to kick-start the project. But like the retreat of the Bull Lake glaciation period more than 100,000 years ago, that’s now in the past. A feasibility study and fundraising plans are just two of the accomplishments Cardamone, who was director of the Aspen Center for Environmental Studies for 37 years, brought to the project. His relationship with the Ziegler family resulted in some guided tours on the property and the possibility of a future interpretive trail on the reservoir’s periphery. While the Zieglers are still in possession of several hundred acres below the dig site, the reservoir is owned by the Snowmass Water and Sanitation District. Land immediately contiguous to the reservoir is managed by the Aspen Valley Land Trust and can’t be developed, according to Cardamone. Other landowners with a say in how the reservoir is used and accessed include the Divide Homeowners Association and resident Jim Benson, who owns the old Krabloonik parking lot where there’s a pipe easement. What can the reservoir tell us? Snowmass Tourism, the town’s marketing arm, operates the approximate 2,000-square-foot discovery center on the Snowmass Village Mall. But in the fiscal report produced by Amaze Design, “They recommend we look hard at Base Village” as a permanent location, Cardamone said. A space of between 2,750 and 7,500 square feet is envisioned. Related Colorado has offered a space in building 2C, located above the transit center. There’s a presumption that if the space isn’t offered for free that it will be highly subsidized by the property owner, Related Colorado. The museum’s operation would still require subsidies. Regardless of its size and even if it draws upwards of 35,000 visitors annually, “Earned revenue will be a little less than what is needed to break even,” Cardamone said. It also costs about twice as much to finish a museum space compared to a standard building, given the lighting, climate control and installation needs. 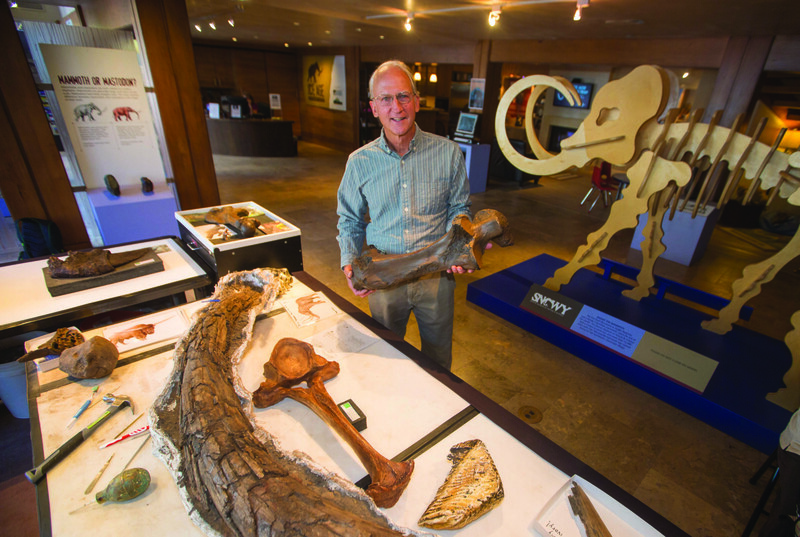 Cardamone said he is intrigued by an offer from Ian Miller of the Denver museum to consider building a fully articulated skeleton of the giant mastodon for the facility. Other reproductions could be developed as public art that would be displayed in Base Village. Three different viewing sites on Snowmass — on the Dawdler run, near the Burlingame cabin and a pond atop the Sam’s Knob lift — are recommended in the Amaze Design report. Expanding onto the ski area for the Snowmass Discovery project would involve the addition of two other landowners — the Aspen Skiing Co. and the U.S. Forest Service — who might have a say in the project. The McCarter report recommends draining Ziegler Reservoir and opening it up to further exploration in the near future. “The opportunity for opening as part of a broader environmental initiative is important,” the report states, noting that only about 5 percent of the reservoir has been excavated. It goes on to say: “Periodic reopenings … would be equally productive with perhaps 50,000 more bones” awaiting discovery. Further exploration also may help to definitively answer a question that’s lingered since the discovery of the Ziegler Reservoir remains: Is there physical evidence pointing to human inhabitation here prior to the last glaciers? Between 2010-2014, the Town of Snowmass Village, through its general fund and the Snowmass Tourism marketing budget, has spent $279,912.53 on the Ice Age project that’s part of the Ziegler Reservoir finds. According to town finance director Marianne Rakowski, the bulk of that total, $224,779.98, was used to support operations at the Ice Age Discovery Center on the Snowmass Mall, including front desk staffing, a paleontologist’s salary and utilities and supplies. The town’s general fund supported a portion of the executive director’s salary ($21,000) and the Amaze Design feasibility study ($25,000). The total contributions made by Snowmass Water & Sanitation, which is a separate taxing district, were not available due to its director’s vacation.